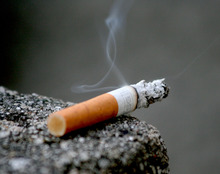 It is widely known that the presence of nicotine in cigarettes is what causes the addictive “good feeling” that draws people to continuously smoke cigarettes or tobacco. It is no question though, that this sought-after euphoria can cause harmful effects on the human body and can cause long-term damage. Nicotine (C10H14N2) is a naturally occurring alkaloid which is an organic compound produced by plants. However, as nicotine is composed of carbon, hydrogen, nitrogen and sometimes oxygen, these combinations of chemicals can have poisonous effects on the body. It should be noted that a regular pack of cigarettes contains 8 to 20 milligrams of nicotine and from that only 1 mg is absorbed when it is smoked. Now on a smaller scale, this means from every cigarette stub containing approximately 1.2 mg of nicotine, the smoker will absorb around 0.1 mg of nicotine from it. Marlboro on the other hand, has lesser nicotine content at 0.8 mg. However, the nicotine content of many American cigarettes has increased significantly in the past years. So, this means the higher nicotine content would naturally result to a higher amount is absorbed by the body. Nicotine content varies not only by brand and type of cigarette but also by country of origin as well. The information of nicotine content is shown on every cigarette package; moreover checking on the company's website can give you the full details. What Are the Effects of Nicotine on the Human Body? The changes brought by nicotine on our brain and body functions are relatively similar to the dose-dependent effects of drinking alcoholic beverages. Since nicotine content greatly varies, it also follows that the effects of nicotine depends on how much and how often one smokes. An average smoker, at first, may both feel simultaneously invigorated and relaxed, just as the first few sips of alcohol loosens and fires up the average drinker. This is a common characteristic seen in the biphasic effect, although nicotine and alcohol have different actions in the body but the belief of its addictive nature has been proven true. One controversial fact that supports this is the direct effect of nicotine on the brain pathway that regulates the feeling of pleasure or “euphoria”. Another significant effect nicotine has on the body is the release of the “fight-or-flight” hormone adrenaline. This initial effect of nicotine triggers a string of reaction that serves a great deal of purpose for the body's energy requirements. Remember jumping out in fright during a scary movie or rushing to finish a project deadline? That's the “adrenaline rush”, the same mild effect that is triggered as nicotine gets absorbed and triggers the rapid release of the hormone. One can recognize adrenaline's effects when you experience the three signs: elevated blood pressure, rapid heartbeat, and rapid shallow breathing. These three always go together and work together to distribute glucose released by adrenaline into the blood to fuel your muscles. The rapid heartbeat speeds up the distribution of blood carrying oxygen to the muscles, and rapid shallow breathing accelerates exchange of gases in the lungs. Once the muscles are all fuelled and fired up then you can either defend yourself from a vicious predator or pump up your leg muscles to run out of danger. Those intending to lose weight also see smoking as a way to do it since nicotine is perceived to cause this effect by curbing the appetite which can be indirectly true. Nicotine blocks the hormone insulin to aid in losing weight as it stimulates chemical messengers in the brain. As we know, insulin is a hormone that delivers glucose into the cell. But since it can't do its work, sugar is accumulated in the blood, creating a state of hyperglycaemia. The excessive sugar in the blood stimulates the chemical messenger and signals the brain to eat less so as not to further add up on glucose. This can also down regulate the hormones and other signals that interpret the feeling of hunger. Nicotine may also slightly increase basal metabolic rate, or commonly known as metabolism. This effect, however, can actually do more harm than good. Burning calories even by just sitting around may sound a great deal but over time, the consequence of this nicotine effect is made obvious by the damage it causes in the arteries. As we all know, increase in the levels of bad cholesterol LDL increases the likelihood to have one suffer a heart attack or a stroke. Therefore, incorporating exercise to lose weight is still a better idea than relying merely on nicotine’s’ effect on metabolism. Maintaining a healthy appetite, raising metabolic levels, and a good exercise regimen can do more good to your body than simply relying on smoking to lose weight.